Quote: 18:49:58 T:139783592404736 NOTICE: Previous line repeats 1 times. 18:49:59 T:139782915086080 ERROR: CCurlFile::CReadState::Open, didn't get any data from stream. I have manage to do a really quick and dirty fix for it. Edit YouTubeFeeds.py line 114 and change "default" to your youtube accont name, in my case "knappas"
Hope it helps anybody until the coders fix it correctly ! I dont wanna be pessimistic, but I cannot login more than six months, I tried maybe everything what ever wrote there, but without success. I wish you luck with searching / trying / testing. I am waiting if somebody update this add-on (maybe for XBMC Gotham 13). I am using 2 factor login for my Youtube / Goggle account. to make the 2 factor login to work. the modified files and not the old ones, it normally do that automatic but just to be sure). and the youtube plugin thinks it is the first time to run. Remember this will delete all saved searches so do a backup of them if you want to save them. Thanks it doesn't really suit my needs for playing subscriptions though. 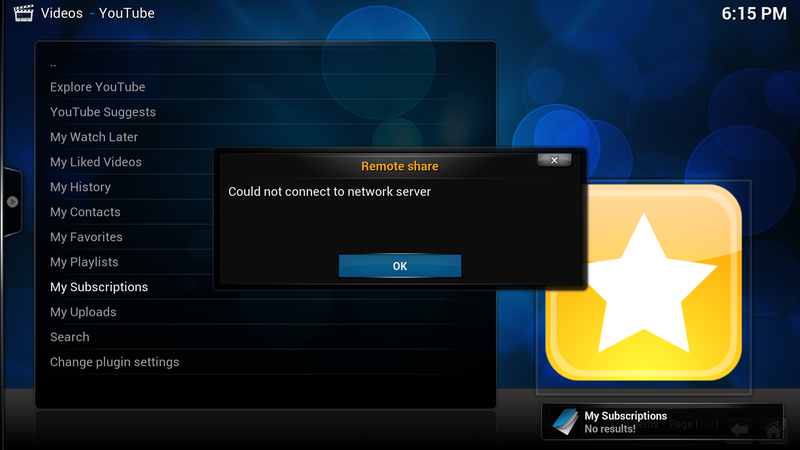 My main problem now is the occasional crashing of xbmc when loading some videos in a playlist. It's probably platform (Raspbmc) related though as I haven't seen any other reports and none of the devs for this plugin have responded. Now I have tried to login with your test account but I cant login either. I can login without problem both to google and Youtube from firefox but not from xbmc. Then I tried to login from http://gdata.youtube.com/demo/index.html, a testpage for youtube I found when I searched for solution for my problem. and last press submit at the bottom of page. I maybe can try to investigate more tomorrow but not now unfortunately.